Located in Saudi Arabia in Al-Ahsa Governorate, Ghawar is considered to be the world’s largest oil field. Ghawar spans 174 miles by 19 miles. Principally controlled controlled by the government entity Saudi Aramco, its presence within the oil industry is significant and it has an influence on the international level. Over 70 billion barrels of oil are said to remain within Ghawar and 5 million barrels today are removed from the fields. Comparatively, the next largest oil field produces 3.7 million barrels a day. 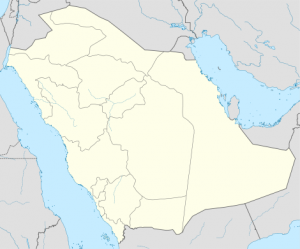 Though there are other oil reserves located throughout Saudi Arabia, Ghawar is by far the most substantial resource of oil — and this means that the control that Saudi Arabia has over the oil market is primarily driven by Ghawar’s oil reserves. Ghawar produces over 60 percent of the oil that comes from Saudi Arabia. At the current rate of oil production, Ghawar’s oil reserves should last almost 40 more years, theoretically solidifying Saudi Arabia’s hold on the oil market. But, of course, it’s impossible to anticipate whether production will increase or at what rate. Without Ghawar’s oil reserves, Saudi Arabia would quickly lose their hold within the oil and gas industry. As of 2008, Ghawar’s reserves had been depleted by 48% of its entirety. With that in mind, Saudi Arabia has historically been less than forthcoming about the data coming from its oil fields. Ghawar’s oil production has peaked and its rate of decline is increasing. In other words, more water and less oil is being brought up from the oil fields, making it ever harder to produce the same amount of oil every day. No one is truly aware of how much these oil fields may be struggling, but the fact that they are struggling means that Saudi Arabia may not hold the throne in the oil industry for much longer. Though the Saudi government believes that the oil fields contain 70 more billion barrels in recoverable oil, a study in 1975 indicated only 60 billion barrels in total, an amount which has almost been reached. This means that these oil fields could potentially already be tapped, with new oil drilling methods notwithstanding. As the efficiency of Ghawar decreases, it becomes even more likely that the domestic oil industry will grow. Ghawar is keeping the Saudi government in the oil race. Without Ghawar, their oil production drops sharply. Recent signs that the oil fields may actually be nearing exhaustion could mean good news for the domestic oil industry. Ghawar is a major oil resource and has a tremendous effect on the current oil and gas industry but it is not the only major player. As international reliance on Saudi oil wanes, reliance on Ghawar will as well, and ultimately Ghawar will become less influential as a shift towards domestic oil is achieved. There is little data available on the Ghawar Field, but OIIP of 200 billion barrels seem to me to be reasonable based on the information I have been able to discover in the public domain. There is a wide range of reservoir parameters over the very large area of Ghawar field and the early estimates of reserves were probably based on very conservative estimates of recovery of about 35% of OIIP. My initial study of the data that I could find suggested that a recovery factor of 50% would be retained and has experience with the decline in production increases with time the recovery from the field should vary from about 45% to 75% and a goal of nearly 70 % for the OIIP should decided as soon as possible. The team will never reach this goal if a much lower goal of say 55% is set as acceptable. If they see with time that they can reach over 70% then they must keep moving this goal upwards to maximize the recovery from this great field.